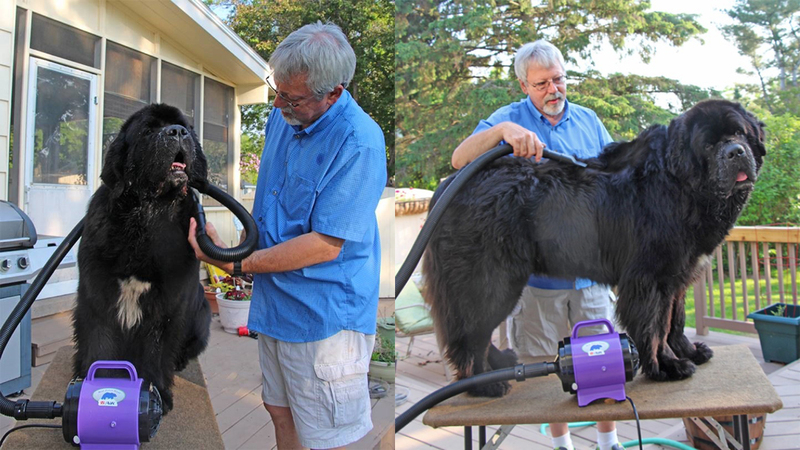 Today, high-velocity dryers are a staple in any grooming salon or home to dry pets. With new technology, high velocity (also called forced air dryers) offer variable speed controls that allow extremely gentle to super powerful airflow. The lowest air setting is recommended when using the dryer on pets with skin issues, cats, or young puppies. Adjusting the dryer to a low airflow is also advised when using around the ears, face, feet and other sensitive areas of a pet. However, there is nothing like a powerful force dryer on high to loosen shedding undercoat, blow off dirt and debris, blast off the water, and quickly dry large pets. A high-velocity dryer can straighten and fluff a curly-coated dog as well as help separate matted areas. Separating the coat with a high-velocity dryer helps to note any warts, skin issues, ticks, fleas, cuts or abrasions before the grooming. High-velocity dryers are a must by the tub area and at each grooming station. Helpful hint: Today, most high-velocity dryers are quieter than the older versions. However, if a pet is noise sensitive a suggestion is to use cotton in each ear to muffle the dryer sound.